For detailed information in English, please visit my website at Artmajeur. Carina Linné was born 1955 in Stockholm, raised in Stockholm and Örebro. Today she resides in Stockholm. Her passion for creative work, especially drawing, started at early age but it was quite late in life, 2006, when she moved to France and became a member of an art association, Le Hangar Centre des Arts, she really started blooming and her hobby became a desire. Five years later, 2011, she was accepted for Liljevalchs Spring saloon in Stockholm with an installation “Nostalgia” consisting of three paintings and music. Other exhibitions followed. In 2009 she moved to Malta for some years. She continued to paint, took lessons in portrait painting, abstract painting and other techniques to broaden her experience. With a group of artists she painted, exhibited and arranged a successful charity exhibition. Previously, Carina worked with communication and marketing. Her background as a copywriter might explain her fascination for storytelling. She wants the beholder to feel, experience and reflect. In some paintings, influenced by events from her own childhood, she presents emotionally touching stories to us from a child’s perspective. And, in the series of paintings with the overall name “Presence”, she wants to draw attention to phenomenons of today’s life. Her intention is to make us see and to evaluate consequences. She also expresses relations, sometimes in symbolic form between animals and humans. She has a penchant for the zebra that often appear in her art. The eyes and body language convey the intensity of the relationship. Characteristic of her art is, despite of the message, a joyful color scheme and a naive style where unexpected things happen. She paints mainly in acrylic and ink but is also experimenting in other media; oil, watercolor, pastels and collage to achieve the desired effect. 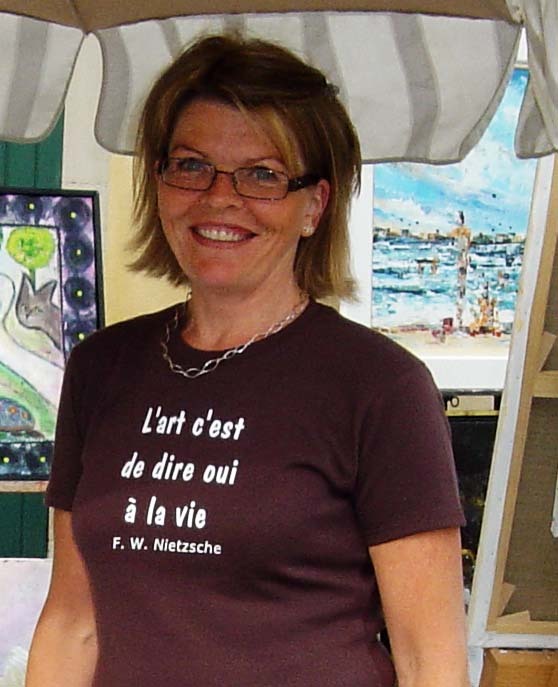 Driven by her curiosity, creativity and a desire to express herself in paintings – and lately also in clay – she has been taken many different classes in France, Malta and Sweden as for example Gerlesborgsskolan, Edsvik Konsthall and private lessons for different artists but also Internet classes. Influenced by simple life experiences, by her childhood and her interest for spiritual questions, she can’t stop herself from creating art in many different styles; storytelling but also abstract art, sacred geometry in silver and paintings with fantasy motifs. Carina’s work can be viewed at her two websites: cleart.se and artmajeur.com/linne but also in her studio in Stockholm, in a small island, Tranholmen.